We have compared Apple iPhone 5S and 5C iOS 7 powered latest smartphone. Check iPhone 5C vs 5S specs, features comparison. Apple was forced to introduce iPhone 5 successor this year itself and not one but two successor phones are unveiled in the worldwide market. 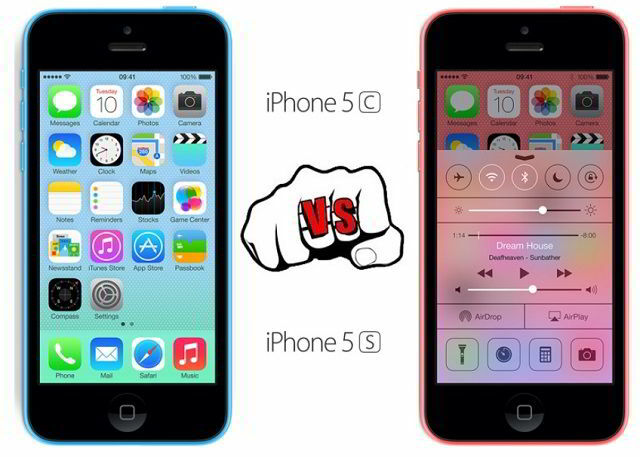 Named as iPhone 5C and iPhone 5S, both the phone are similar but there are some differences. There isn’t much difference between iPhone 55 and 5C latest iOS 7 phones and to dear it out we have come up with a detailed comparison of both these smartphones here. In terms of display, Apple brings the best with iPhone 5 display and there is no way Apple should have made it better. iPhone 5S and 5C are with 4 inch Retina display providing 640 x 1136 pixels resolution with 326 ppi pixel density. The major difference – iPhone 55 adopts fingerprint scanner dubbed as Touch ID by Apple and this feature is not found on 5C model. This fingerprint technology replaces the normal way to unlock your touchscreen phone by index finger scanning. This Touch ID button replaces the home button covered up with sapphire crystal glass. So the security on Apple phone is taken at step 1 itself, rather than in-built security system. iPhone 5C comes with polycarbonate plastic body while 5S gives the same metallic finish as found on iPhone 5 phone. Furthermore, iPhone 5S is packed with next-gen A7 Chip with 64-bit architecture coupled with Apple M7 motion processor. 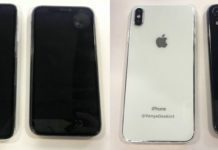 Apple for the first time shows iOS device in different colors of green, pink, yellow and Blue apart from normal black and white colors. iPhone 5S comes in Black/Slate, White/Silver, Gold while iPhone 5C adopts White, Blue, Green, Yellow & Pink variants. 25). • iPhone 5S A1453: CDMA EV-DO Rev. A and Rev. B (800, 1700/2100, 1900, 2100 MHz); UMTS/HSPA+/DC-HSDPA (850, 900, 1700/2100, 1900, 2100 MHz); GSM/EDGE (850, 900, 1800, 1900 MHz); LTE (Bands 1, 2, 3, 4, 5, 8, 13, 17, 18, 19, 20, 25, 26). • iPhone 55 A1457: UMTS/HSPA+/DC-HSDPA (850, 900, 1900, 2100 MHz); GSM/EDGE (850, 900, 1800, 1900 MHz); LTE (Bands 1, 2, 3, 5, 7, 8, 20). • iPhone 5S A1530: UMTS/HSPA+/DC-HSDPA (850, 900, 1900, 2100 MHz); GSM/EDGE (850, 900, 1800, 1900 MHz); FDD-LTE (Bands 1, 2, 3, 5, 7, 8, 20); TD-LTE (Bands 38, 39, 40). • iPhone 5C A1532 (GSM): UMTS/HSPA+/DC-HSDPA (850, 900, 1700/2100, 1900, 2100 MHz); GSM/EDGE (850, 900, 1800, 1900 MHz); LTE (Bands 1, 2, 3, 4, 5, 8, 13, 17, 19, 20, 25). • iPhone 5C A1532 (CDMA): CDMA EV-DO Rev. A and Rev. B (800, 1700/2100, 1900, 2100 MHz); UMTS/HSPA+/DC-HSDPA (850, 900, 1700/2100, 1900, 2100 MHz); GSM/EDGE (850, 900, 1800, 1900 MHz); LTE (Bands 1, 2, 3, 4, 5, 8, 13, 17, 19, 20, 25). • iPhone 5C A1456: CDMA EV-DO Rev. A and Rev B. (800, 1700/2100, 1900, 2100 MHz); UMTS/HSPA+/DC-HSDPA (850, 900, 1700/2100, 1900, 2100 MHz); GSM/EDGE (850, 900, 1800, 1900 MHz); LTE (Bands 1, 2, 3, 4, 5, 8, 13, 17, 18, 19, 20, 25, 26). • iPhone 5C A1507: UMTS/HSPA+/DC-HSDPA (850, 900, 1900, 2100 MHz); GSM/EDGE (850, 900, 1800, 1900 MHz); LTE (Bands 1, 2, 3, 5, 7, 8, 20). • iPhone 5C A1529: UMTS/HSPA+/DC-HSDPA (850, 900, 1900, 2100 MHz); GSM/EDGE (850, 900, 1800, 1900 MHz); FDD-LTE (Bands 1, 2, 3, 5, 7, 8, 20); TD-LTE (Bands 38, 39, 40). So what’s your color for next iPhone? So with our comparison, we can be drawn the conclusion that iPhone 5S is certainly a perfect successor to iPhone 5 phone while 5C is purely made to decrease the price of the handset so that it can compete in the market amid growing shares of local vendors.